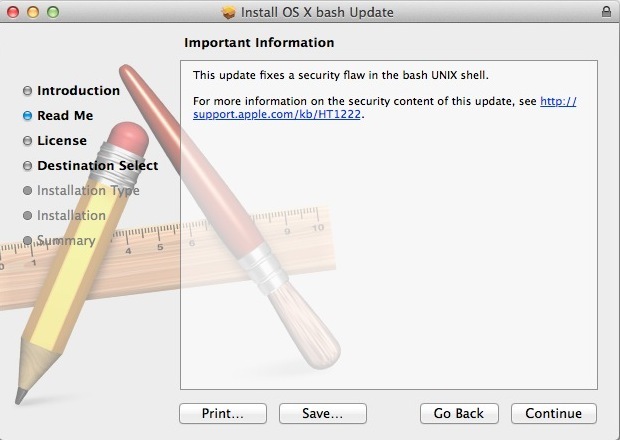 Apple has released an important security update for Mac users, labeled as OS X Bash Update 1.0. The update addresses a recently discovered critical security flaw known as “Shellshock” that impacts the bash shell, the default shell used by the Terminal app of OS X, and is recommended for all users to install even if they don’t use the Terminal app, bash, or command line on the Mac. The download is very small, weighing in around 3.5MB, and the release notes simply state “This update fixes a security flaw in the bash UNIX shell.” The security patch is currently available as three separate downloads for OS X Mavericks 10.9.5, OS X Mountain Lion, and OS X Lion. A bash patch for OS X Yosemite Public Beta and Developer Preview releases are not yet available. Note that Mac users must be on the latest versions of their respective releases to install the update. Despite being a small update, it’s good practice to do a quick backup of your Mac with Time Machine or your backup software of choice before installing any system updates. At the moment, the OS X Bash Update is only available through the Apple Support website, but presumably will also be released through the Software Update mechanism of OS X in the near future. The “advanced UNIX services” that Apple references are presumably Remote Login and the SSH server, which allow for remote administration, though a user would still need a valid login to gain access to a Mac, and another theoretical attack vector through weaknesses found possible through the optional OS X Apache web server, which allows Mac users to host webpages directly from their Mac. Again, it’s fairly unlikely that many Mac users have been at risk, even if they use the Remote Login or web server features of OS X. What about a Bash patch for Mac OS X Snow Leopard? At the moment, Apple didn’t release an official bash patch for Snow Leopard, which means 10.6 users will need to install the new version of bash themselves. UPDATE 2014-09-29 at 5:00 CDT (GMT -5:00): Apple has released a “1.0″ patch for bash. They have yet to send out their normal announcement to their Security-announce mailing list. The Apple patch updates bash to 5.3.23 (same as where we were last Friday). Apple’s patch also places a new profile and bashrc file in /private/etc as well as updated man files/documentation. Oddly there is a new file is also placed in /usr/bin/ named bashbug. So what version number should bash report after the update? You left a comment asking to remove the comment? For some other installation this happened but I was able to `rm -R /var/folders/*` and get past it; not this time. Testing by ZDNet showed that while the patch fixed the issues outlined in the original CVE-2014-6271 report and CVE-2014-7169, OS X remains vulnerable to CVE-2014-7186. This is UNSUPPORTED and UNOFFICIAL, but you can install the bash patches on any almost version of OS X. For example, you can use the Lion bash patch with Snow Leopard. This is fairly technical, but chances are that if you’re still running Snow Leopard you’re fairly proficient so it may not be too crazy for you. This is UNSUPPORTED and UNOFFICIAL. You can also use this trick to install the OS X Mavericks version on earlier versions of Mavericks from 10.9.5 (like 10.9.4 for example). NO UPDATE FOR SNOW LEOPARD ??? Here’s for the crazy ones, the misfits, the trouble makers, the round heads in the square holes. The ones who see things differently… and are still running Snow Leopard. George, this is really great. Can you cover what was changed in the .pkg file exactly so that others can do it themselves? Many users are not comfortable installing pkg files from the web (understandably) so a way they could self-patch the installer to work in Snow Leopard would be excellent. See “Edit 1” in the blog post. Cheers. 3 UPDATES ??? Thre are 3 differents versions ??? Yes, unless you are triple booting all three versions of OS X you only need to pick the one for the version you are running.